Today, I want to share the results of my $20 Facebook Sponsored Ads experiment. I did this experiment to show YOU the power of Facebook, and how it can help you grow your business and promote your brand, when you do things the right way. I’ve been using Facebook Ads for quite some time now to promote my websites, my online businesses and different affiliate products. I’m by no means an expert, but I do have a good understanding of how it works and what to do. Through the past couple years I’ve gotten mixed results with the Facebook Sponsored Ads. In recent months, I really figured things out and wanted to do an experiment to show what you can do with Facebook. As a quick disclaimer, my success is no guarantee of your success. Individual results will vary. I created an ad in Facebook Sponsored Ads that targeted my fan base (about 7,700 fans when I started) and their friends. My ad was designed to promote my 7-Day FREE MLM Boot Camp. The ad talked about the benefits of my boot camp. I sent people to my capture page to generate leads (very important lesson), not to a sales page. My capture page is nothing fancy. In fact, it’s not even a website. It’s just my actual opt-in form that is hosted by Aweber. Listed below is a copy of the ad I used. 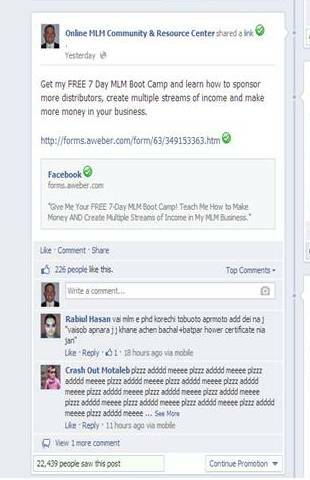 In case you can’t read it, it says “Get my FREE 7-Day MLM Boot Camp to learn how to sponsor more distributors, create multiple streams of income and make more money in your business.” Here is the link I used in it. As I see it, my ad was a tremendous success. Here are the results and key numbers. The first photo is from Facebook. It shows all the details I just explained above. This next photo is from my Aweber auto-responder. It shows the clicks on the page I was promoting, the total leads and the conversion rates. When it comes to money, I will re-coop my advertising money within a few weeks through affiliate sales. For every lead I generate, they get an email a day for me for the first 8 days and then about 25 to 30 emails over the next month. A decent percentage of my leads buy one or more affiliate products, so the approximate $1 per lead that I paid is very good. I track the results so I will know how much income these new leads produce. Here are some valuable lessons you can learn from my $20 Facebook Sponsored Ads Experiment. 1. Facebook Works: The Facebook Ads program works. When you do things right you can generate a lot of leads through Facebook. 2. Send People to an Opt-In Page First: One of the most important lessons I can share with you is to send people to an opt-in page first. Give away something with a high perceived value for free and collect names and emails. 3. Target Your Audience As Much As Possible: Ideally, you want to focus on targeting people that are right for your offer. The more targeted you can get, the better conversion rates you will get. 4. 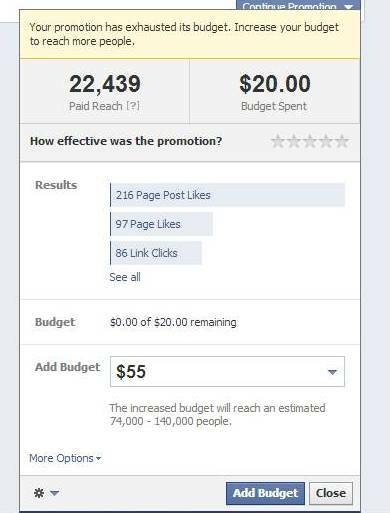 Start Small and Track Everything: Don’t think you need to spend hundreds or thousands of dollars to get started with Facebook Sponsored Ads. You don’t. Start with $10 to $50 and do a test. Find out what happens. Tweak what you do and keep testing until you find something that works for you. Once you do that you can roll out your major advertising campaign. 5. Give Away Something for Free: One of the most important lessons you can learn is to give away something for free (on the front end) rather than try to sell something. People love free stuff if it has a high perceived value. Once they opt-in and get their free item you can send them to a sales page to sell something. As you can see the results are phenomenal! Anytime you can get leads for less than $2 each, let alone less than $1 each, you are doing something right. This is the power of Facebook advertising. 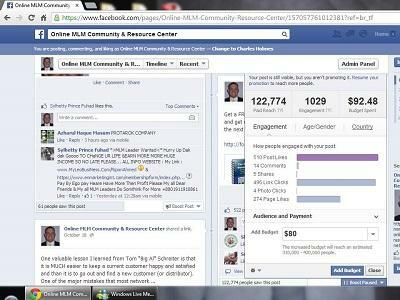 I just did another Facebook Sponsored Ads test on Facebook to get more leads and grow my fan base. This time I gave away my free eBook “The Secret MLM Website Strategy” along with my 7-Day MLM Boot Camp. I spent $92.48 on the test and did the test over a three day period. Here are the results. As you can see the results are phenomenal! I got 124 new leads at an acquisition cost of 75 cents each, plus I got 274 new fans for my fan page! Not bad for three days work. If I would have spent $500 on the test and had the same results, I would have had almost 650 leads and more than 1,000 new fans. Try doing that with any other advertising medium! Here is a photo of my results just to show you I am not making this up. . In summary, my $20 Facebook Sponsored Ads experiment went very well. My next test will be with $100 to see if I can get a lower cost per lead and higher conversion rate. I’ll keep you updated on how things go. What are your thoughts? What do you think about my Facebook Sponsored Ads experiment? What type of results have you gotten with Facebook? Leave a comment and let us know. I have been wondering about Facebook ads, as well. Twenty dollars seems like a minimal investment, but I still did not know if it was worth going to the trouble to make up an ad and spend the money to get nothing in return. I am very impressed with the number of people that your $20.00 ad reached, and even more impressed with the numbers on your $100 experiment. I would like to see numbers like that on my website. Thank you for going being the guinea pig here. Hi Chuck. Greetings from Indonesia. I just got rejected by Facebook ads because violated their terms by promoting MLM. I was also got rejected from adwords. I sent them a message trying to give argumentation toward the rejection. But, I got rejected anyway. I’ve been thinking about what you said sending people to opt-in pages first, since in stiforp there were tools available for that, including auto-responder, contact system and source code analytic. Other than that, stiforp system also already perfected to gain subscriber. But now the question still how to pass Facebook barriers. I made another landing page as a doorway. It worked in adwords, but I haven’t try in FB. Now I’m trying for the 3rd time sending people to different pages with post content more like telling people something other than just ordinary sales pitch. Well let just see if it works. If not, I’m gonna take serious consideration toward your tips. Thanks. Thank you very much for sharing these figures sir. I have often wondered how Facebook ads would do, but I have been hesitant to experiment. I guess you did the difficult work for me. As a writer and author of many books, I think I will do the same to see if I can generate some book sales. It seems this is a much better conversion rate than even the popular Google Adwords. Have you done any experimentation with different ads to see if the types of ads would also make a difference? It seems to me that an experiment of that type would be good too. Some people are more apt to click thru certain ad structures more than others. Just a thought. Again thanks for the figures. 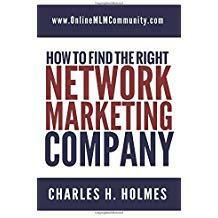 They should be very helpful to many network marketers out there. I’ve experimented a little with my photos and wording, but that is about it. I wouldn’t use the Sponsored Ads to sell something, but they do work well to generate leads. My website has been building steam, so I am about to go ahead and try out this Facebook experiment also. When I purchased the website, I received $50 in free Facebook advertising with it, so there will be no cost on my part except time; something it seems I just do not have much of right now. I am happy to see how well it worked for you. I hope I do as well. I am also considering running an experiment through Google Adwords and see how it does. I will attempt to let you know how it goes. Facebook ads can work, but you have to start small and do a test. I’ve found the quality of the traffic is very bad. Most people who click on my ad and visit my website stay on my site less than 20 seconds. The average time on my site is about 2 minutes per person so this is unacceptable to me. Since Facebook is one of the most popular social media outlets today, it would only make sense to use it to promote a MLM business. I am not surprised the $20 Facebook sponsored ad experiment was a major success. I am sure the $100 test with the slight modification in conversion rate will be more successful than the $20 experiment.